I first heard the term fracking in 2010 during the weeks leading up to the world premiere of Living Downstream, my documentary adaptation of Sandra Steingraber’s acclaimed book on cancer and the environment. The film is shot across North America, but a big portion of the film takes place in upstate New York, where Sandra now lives with her family. And our premiere was scheduled to happen in Ithaca. So it made sense for Sandra to send me “Shale Game,” her first piece for Orion Magazine about fracking. In the essay, Sandra describes the village in which she lives, the sidewalks made of shale that line her street, and the environmental health threats that fracking poses to this lovely community. I was amazed by what I read. If you don’t know much about fracking, you should read it. You will be amazed too. Slickwater hydraulic fracturing (also known as fracking)—combined with horizontal drilling—is a fairly new method of natural gas extraction. The process involves pumping thousands of gallons of high-pressure fresh water containing a mixture of toxic chemicals deep underground, into the shale layer of the Earth’s crust. This pumping fractures the shale and releases bubbles of methane (natural gas) trapped there. At the same time, it unleashes countless toxic substances, relies on incredible numbers of diesel-powered trucks, and forever poisons vast quantities of water. Fracking is beyond risky. It is an uncontrolled experiment that turns the earth inside out, releases carcinogens into communities, and ignores the rights of future generations. Fracking is contamination without consent. Because Living Downstream was already completed by the time I learned about fracking, the film does not address the topic of fracking at all. And yet the two are profoundly interconnected. The film is about the ways in which toxic chemicals travel through our air, water, and soil. Fracking makes use of toxic chemicals and then sends them on a similar journey into the wider environment. The film is about the ways in which toxic chemicals are thought to be affecting human health and contributing to the burden of cancer. Fracking makes use of chemicals that are known to cause cancer—not to mention neurological disorders and reproductive harm. Mostly, my film is about Sandra Steingraber’s work to break the silence about the link between environment and human health. Fracking—and specifically the threat posed by fracking to her home of New York State—has kicked Sandra’s environmental health work into high gear. She is standing on the frontlines with thousands of grassroots activists and is asking the rest of us to join the fight against fracking. 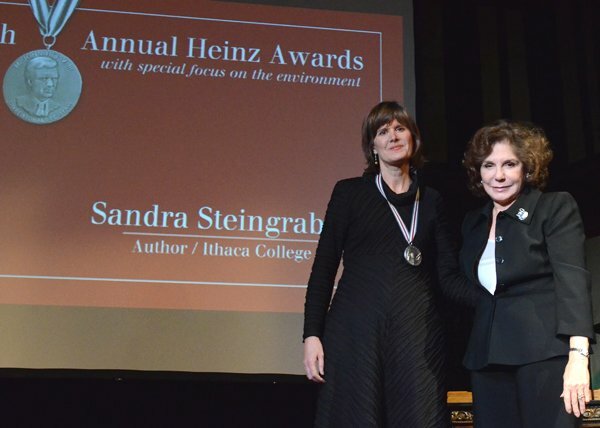 In November 2011, Teresa Heinz and the Heinz Family Foundation presented Sandra with a prestigious Heinz Award for her work calling public attention to the effects of toxic chemicals on human health. The Heinz Awards celebrate individuals who have had a meaningful and enduring impact with their efforts to improve the lives of others. In her statement, The Heinz Award and What I Plan to Do With It, Sandra dedicated the $100,000 award to the ongoing grassroots struggle against fracking. In March 2012, Sandra announced that the Heinz Award would be used to launch New Yorkers Against Fracking, a statewide coalition. Just as Sandra’s words—written and spoken—have been a powerful tool in the fight against fracking, I hope our film can also serve in this important fight. I hope you’ll join the fight too. To quote Sandra: Bring what you can. Chanda Chevannes is a Toronto-based documentary filmmaker and writer. Her first feature-length documentary, Living Downstream, is currently available for public screenings. The Living Downstream Educational DVD is also being made available to grassroots anti-fracking groups at a discounted rate.